Hi! I treated this one for Kookyrabbit a little bit differently than the other two. 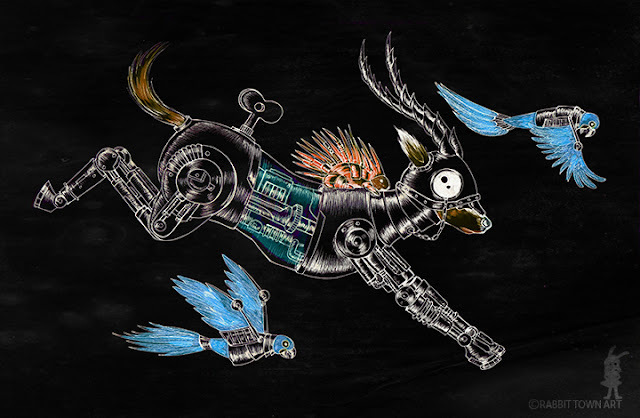 I have forgotten how much fun it is combining machinery with animals. I had some Machine drawing help on the gazelle from my partner , Rob, for this one. We're talking about doing a bigger piece where he helps out with the machine side of things too. Why not? Then we'll put it up on my Redbubble shop! Mm...it's been mostly a personal drawing day today and Rob and I are going out on a date. Date nights are good to have , I think. Tomorrow, is a big animation and book illustration day.